For many small business owners, finding the time to maintain a blog is hard enough, without having to be active on Facebook and Twitter. Thankfully, if you're running your site using the Wordpress CMS platform, you can easily automate the publishing of each of your blog posts to your Twitter and Facebook accounts. Download the free Wordpress plug-in WP to Twitter. Once you activate the plug-in, it leads you through easy step-by-step instructions for linking your Wordpress site to auto-update your Twitter account with a Tweet of your latest blog post. Now, link your Twitter account to your Facebook account. Voila! You've just completed the steps, so that everytime you publish fresh content on your blog, it will also update both of your social media sites. As of this writing, there is still not a reliable plug-in that updates your Google Plus page. So, you'll have to manually add that. You can easily do this by adding a social sharing plug-in which has capability for Google+ sharing. Then just share the content once you write it. What method are you using to share your content now? Did I miss anything? If you've searched for any sort of local service or product recently in Google, you've probably seen Google Places listings in action. These listings are the ones marked by the red pushpins (see photo at right). 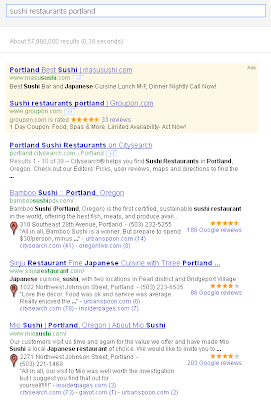 Often, these listings will appear before organic website listings, which means they are more likely to be clicked upon. 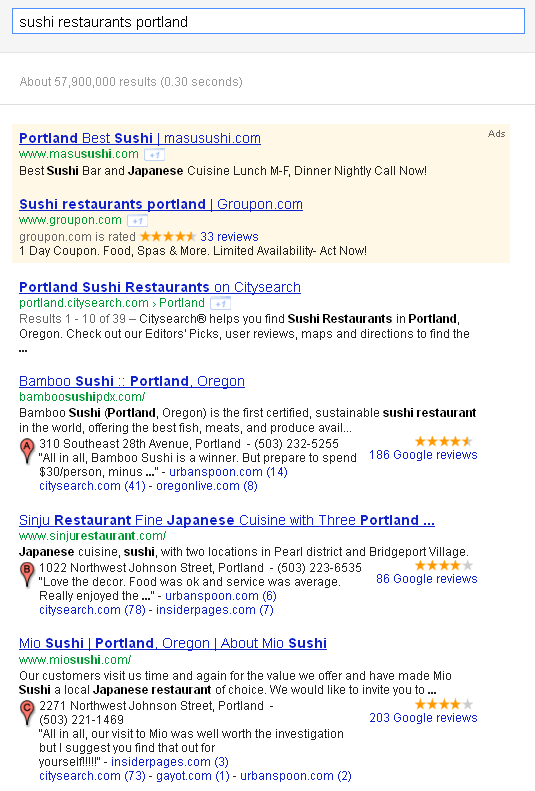 NOTE: An all new and updated Guide To Ranking Your Business in Google has been published on my main website. What does this mean to a business owner who is trying to get more visitors to come to their website? It means that it is harder to rank highly in search results and that means it's a lot harder to get visitors to their website. With so much importance being put on Google Places rankings, most business owners still have not claimed their Google Places listing* - let alone done any work to optimize the listing for search engines. Does this mean your website can't be found online? No, it doesn't. Some stand alone websites may still outrank the local listings, and sometimes even an "unclaimed" Google Places Listing can still rank on page 1 of search results. But this is the exception, however, not the norm. Savvy business owners know better. The best way to ensure being seen in page 1 search results is to claim your Google Places listing, optimize it for search, and then build quality back links so that your site becomes stronger over time. A business website with a long term search engine optimization strategy can become virtually "competition-proof". That means they have a solid hold on the coveted #1 position and are getting 40-50% of all the traffic for their target keywords. If you would like to claim your Google Places Listing and do your own search engine optimization work, I have created the tutorials here with advice on how to do it yourself. If you'd rather focus on your business and hire me do it for you, I'd love to help you. Either way, feel free to contact me with any questions. I promise to return your call or email.